Congratulations to (L to R) Logan, Anthony, Damien, David, Speedy, Abraham, Jon, Rafinoe, Xavius and coaches Jerry Lanford and Tony “Marco” Castillo. The U9 SR Black Oaks added another 1st place finish to their 2013 achievements. 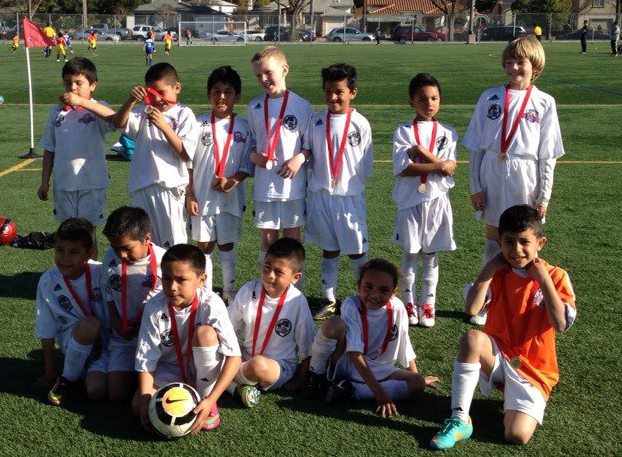 This evening they won a thrilling final against a tough East Bay Ajax team that was heavily favored. Ajax scored early, leaving the Black Oaks to chase play for much of the rest of the game. Oaks leveled towards halftime. In the second half Ajax scored again and the Oaks had to raise their game to find the tying goal before overtime. Both teams were going all out and the referees had their hands full to keep the game under control. The Oaks were playing with one sub and some rough play was almost a setback, with a few players subbing off due to injury. But the Black Oaks proved resilient in over-time, turning up the pressure and finally pushing Ajax back into their own half. They got the break they needed when Ajax mistakenly deflected a clearing ball into their own net. Just seconds later another hard shot challenged the Ajax keeper, pushing him back as he caught the ball. The center referee played on, although the linesman ruled the ball crossed the goal line. The final score was Black Oaks 4, Ajax 2, earning gold medals a champion t-shirts. 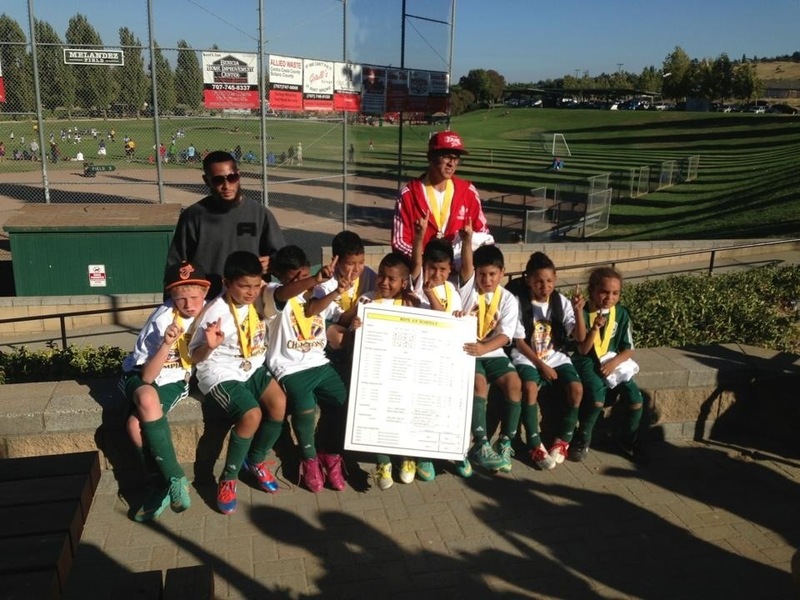 Last month, the same U9 boys team won the Sonoma State Six-Aside Tournament. 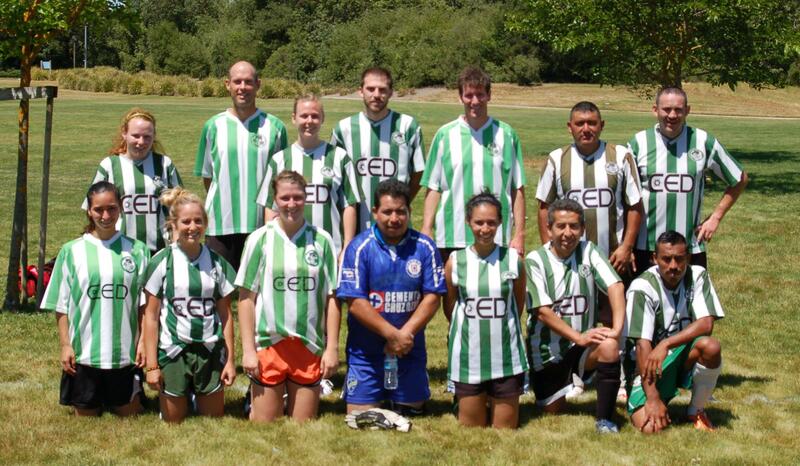 In February the team placed third in the Redwood City Torneo di Presidenti. A very close game. Black Oaks played well. Meet the two Lou’s, Black Oaks Lou Chambrone and Luis Martinez. Back in 2003 a youth soccer program was just a dream for the Black Oaks, but Luis and Louie also had a dream to coach soccer. 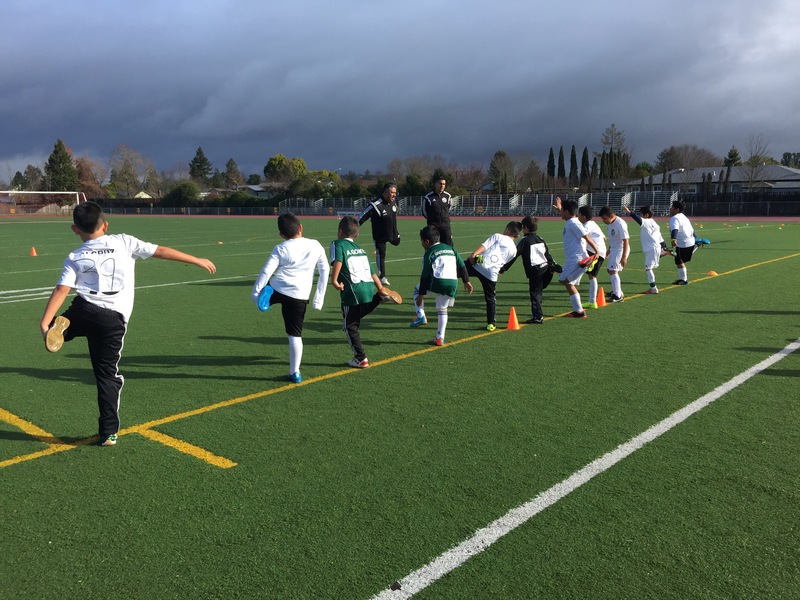 From 2003 to 2009, under the Black Oaks name, the two Lou’s volunteered as coaches and assistant coaches for several competitive boys soccer teams from Laguna Youth Soccer and later Santa Rosa South Soccer league. 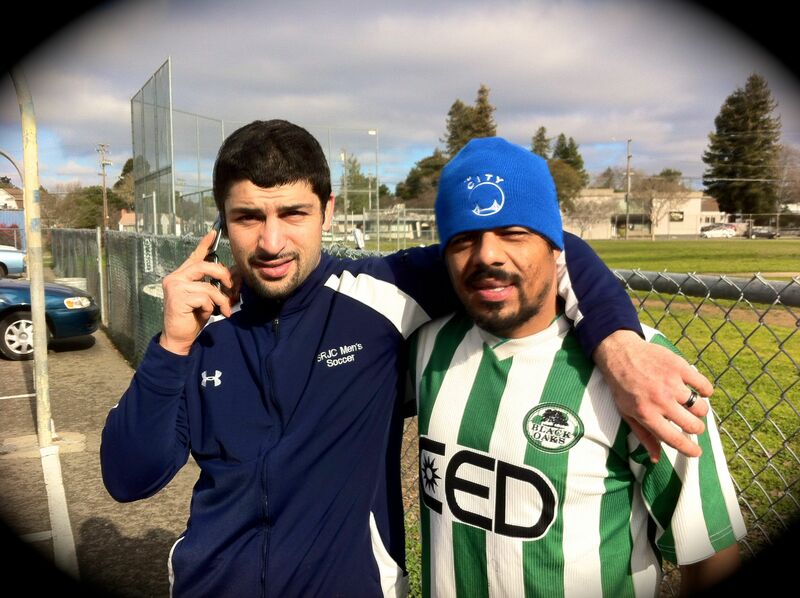 Luis Martinez started in 2003 working as an assistant coach at the Santa Rosa Junior College because he was inspired by other members of the Black Oaks to go into coaching. He was offered an opportunity to volunteer as head coach for a Laguna travelling boys team and Chambrone joined later that season. They called themselves the Laguna Black Oaks. The two friends sparked a chemistry with their team, using a coaching style typical to older teams with strict discipline, teamwork and a lot of running. They say the boys responded well to the regimented training sessions and the parents appreciated the character it built in their boys. The results showed. The team won the local Class 3 league in 2004 and success continued with four subsequent seasons. Martinez acknowledged the support and encouragement of Adolpho Mendoza, technical director for Atletico Santa Rosa, a rival club in Santa Rosa. Chambrone continued coaching, his U12 team losing in the State Cup semi-finals in 2009. He is proud that some of the Black Oaks have gone on to play at the Santa Rosa Junior College, including Diego Leon and Danny Chapparo. One player Luis Luna, because of all the running at practice, became a star Cross-Country runner and earned a full scholarship to UC Berkeley. Now these two are out of coaching and looking forward to playing. They both have new families and say they are looking forward to coaching again when they have children. But their dream has been kept alive by parents and younger siblings of the Black Oaks… but that’s the next chapter. The Black Oaks would not exist were it not for the volunteer work of many too numerous to name, those like Luis Martinez and Louie Chambrone. 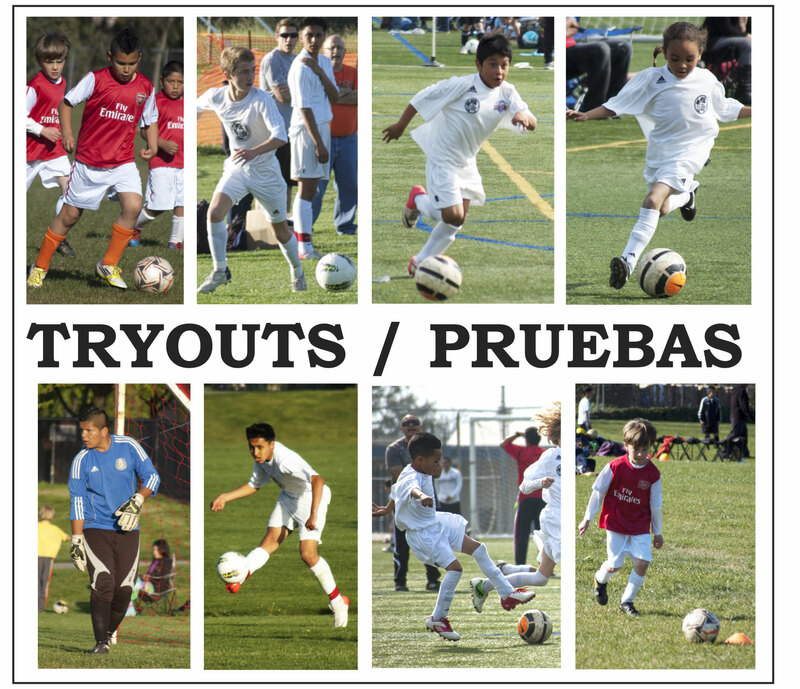 The club is recruiting new players and coaches. If you love soccer or have a talent you wish to share in making a difference for young soccer players, join us. Volunteer today! 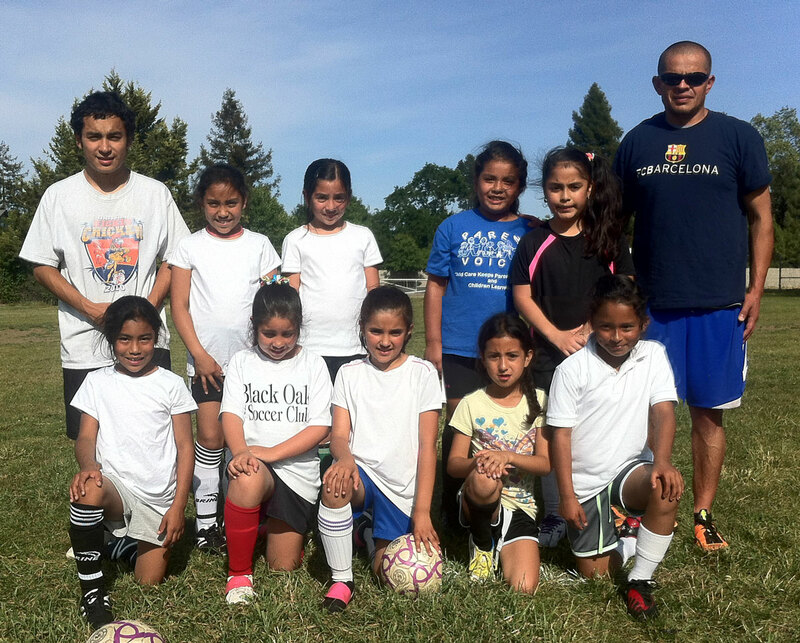 The Torneo dei Presidenti is the first tournament in which Black Oaks youth soccer has competed as its own club. Well, they had reason to celebrate with some tough, impressive play, placing second in group play and placing third and earning a bronze medal overall via a dramatic penalty kick shoot out.